The latest episode of Star Trek: Discovery has revealed the identity of the Mirror Universe Emperor of the Terran Empire - and it's none other than Philippa Georgiou. "Captain Michael Burnham. You've been away too long. Though I can't say the same for your prisoner [Lorca]. I do not appreciate having to warp my way across the quadrant to clean up your untended mess. When I give an order, I do not expect to be ignored. Don't you bow before your Emperor?" 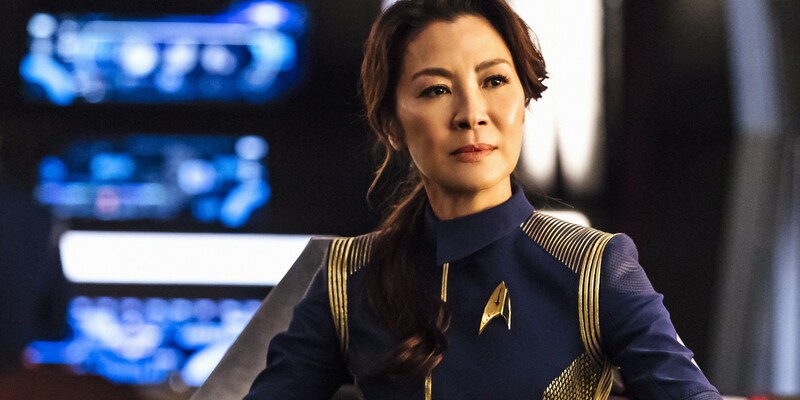 Georgiou, played by Michelle Yeoh, was the captain of the USS Shenzhou in the Prime Universe, where Michael Burnham served as her loyal first officer. But Burnham's mistakes in the opening episodes of the series resulted in the demise of the Shenzhou and Captain Georgiou's death at the hands of the Klingons, an error that resulted in Burnham being court-martialed and drummed out of Starfleet - until Captain Lorca plucked her out of prison to exploit her skills. Georgiou's death is a burden Burnham carries with her at all times, as she attempts to live up to the ideals of the mentor she let down. Burnham being forced to interact with a version of Georgiou who is likely the polar opposite of the benevolent captain she knew and loved is certainly some fertile storytelling ground, as the crew of the Discovery must maintain their cover as they attempt to return to their universe. The previous episode, "Despite Yourself," hinted that the key to their return trip home lies with the USS Defiant, a vessel that has direct ties to both the original series and Star Trek: Enterprise. The Defiant was inadvertently sent into the Mirror Universe's relative past in the TOS episode "The Tholian Web," and was eventually commandeered by the treacherous crew of the ISS Enterprise, led by the brutish Commander Jonathan Archer in the Enterprise two-parter "In A Mirror, Darkly." The Defiant was a century more advanced than the technology of the 22nd century Mirror Universe it had been sent to, and Archer planned on using its power to overthrow the Terran Emperor. However, Archer was thwarted by his concubine, Hoshi Sato, who poisoned Archer and took command of the Defiant, supplanting him as the new Emperor. That's the last concrete information we have on the Terran Emperor, and it will be interesting to see if Discovery hints at how Sato's reign ended and Georgiou's began. The treacherous nature of the Mirror Univere's Terrans certainly makes it possible there were dozens of emperors between Sato and Georgiou, but the show's acknowledgment of the Defiant suggests there will be some continuity between the two series' tales of the Mirror Universe. Georgiou's reveal as the Emperor may not be shocking, but it opens up some intriguing story possibilities for both new and old Star Trek fans. More: Star Trek Discovery: How Will [SPOILER] Return? Star Trek: Discovery's first season continues with "Vaulting Ambition" on Sunday, January 21st at 8:30 PM ET on CBS All Access.